Dengue like any neglected tropical disease affects a large part of the world population. In this disease, the infection is caused by arboviruses transmitted by the A. aegypti and A. albopictus mosquito, in which its most severe manifestation is known as dengue hemorrhagic fever. The infected person presents symptoms characteristic of such as fever and rash. Among the ways of fighting dengue by bioactives is the inhibition of NS2B-NS3 protease, inhibition of protein E, and inhibition of sclerotization of the vector cuticle. The cuticle is indispensable for the survival of the mosquito that can be compromised through the inhibition of arylalkylamine N-acetyltransferase (aaNAT). In the studies shown, in silico tests were performed as molecular docking, functional density analysis, molecular orbitals energies with the analyses of the interactions between bioactives and the targets studied. However, in addition to discussing the fight against dengue virus infection through different routes, in this paper, some in silico results of 27 analogs of myricetin have been presented, which showed action on the cuticle sclerotization mechanism. Keywords: Dengue, NS2B-NS3, aaNAT, Molecular docking, Virus, Neglected tropical disease. Keywords:Dengue, NS2B-NS3, aaNAT, Molecular docking, Virus, Neglected tropical disease. Abstract:Dengue like any neglected tropical disease affects a large part of the world population. In this disease, the infection is caused by arboviruses transmitted by the A. aegypti and A. albopictus mosquito, in which its most severe manifestation is known as dengue hemorrhagic fever. The infected person presents symptoms characteristic of such as fever and rash. Among the ways of fighting dengue by bioactives is the inhibition of NS2B-NS3 protease, inhibition of protein E, and inhibition of sclerotization of the vector cuticle. The cuticle is indispensable for the survival of the mosquito that can be compromised through the inhibition of arylalkylamine N-acetyltransferase (aaNAT). In the studies shown, in silico tests were performed as molecular docking, functional density analysis, molecular orbitals energies with the analyses of the interactions between bioactives and the targets studied. 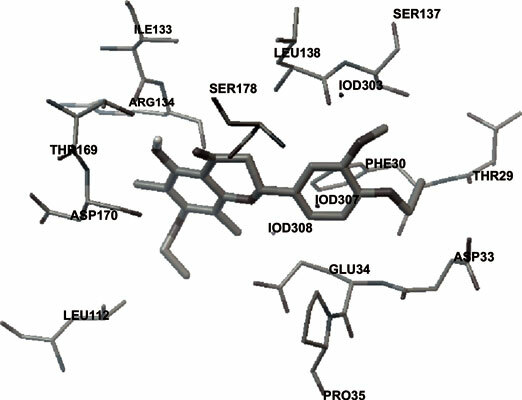 However, in addition to discussing the fight against dengue virus infection through different routes, in this paper, some in silico results of 27 analogs of myricetin have been presented, which showed action on the cuticle sclerotization mechanism.